Skills and abilities: Skilled magic user in the element of earth. Powers: Described as a ‘dirt witch’ Ainet has the ability to control sand and silt for a variety of effects. She sent a animated statue to Storm from Africa to America when she needed Storm’s aid. While under the Shadow kings thrall she also created solifide constructs of sand and sand storms. The dirt witch Ainet grew up in the Kenyan part of the Serengeti in a Maasi tribe. From early on she used her abilities to help her tribe. Thanks to her power and her status within the tribe she grew to an old age though she never bore children. 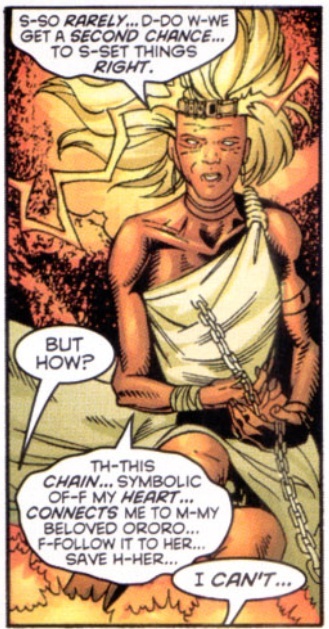 After Achmed El Gibar had cast out a young Ororo Monroe and after she had met a young T’challa future leader of Wakanda and her powers had just begun to manifest, Ainet took her into their village and became her adopted mother. She was the first one to realize that Storm’s power allowed her to move around existing weather patterns as opposed to creating new patterns. It’s assumed she remains in the village to this day.